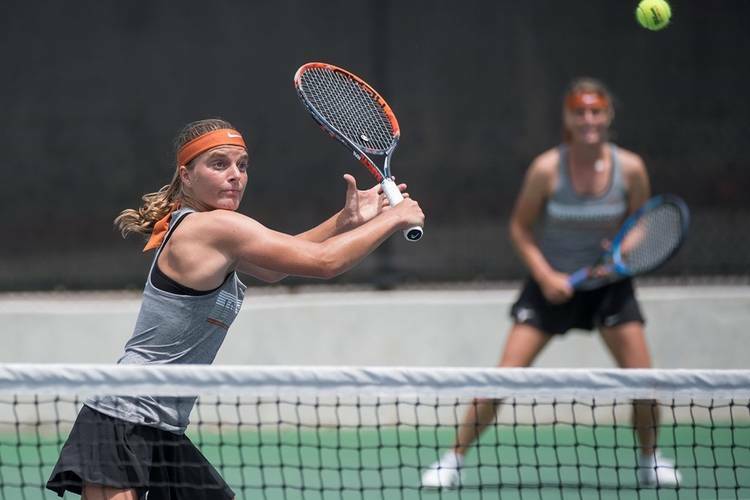 Four Longhorns advanced to the singles quarterfinals after wins at the ITA Texas Regionals in College Station on Friday. Anna Turati topped Brandelyn Fulgenzi in straight sets before beating Maria Kononova of North Texas 6-1, 7-5 in the round of 16. She opened the day with a 6-0, 6-1 win over Fulgenzi. Turati also won her match in the opening round, defeating Stephanie Belovukovic of Houston 6-0, 6-2 Thursday. Katie Poluta beat Jasmin Buchta of Lamar 6-3, 6-3 Thursday and won twice more Friday in straight sets. She beat Almudena Boza of UT-Arlington 7-5, 6-1 before a 6-2, 6-1 win over Ndindi Ndunda of Houston. Bojana Markovic beat Nicole Petchey of SMU 6-2, 6-2 while Fernanda Labraña won 7-6 (7-5), 7-6 (7-5) over Vivienne Kulicke of SMU in the opening round. Markovic kept it going Friday, topping Dominique Ibarra of UT Rio Grande Valley in a marathon match 6-4, 4-6, 1-0 (10-7) before a straight-sets win in the round of 16. Labraña notched two straight-set victories Friday. She opened the day with a 6-1, 6-3 win over Camille Townsend of Texas A&M-C.C. Labraña then won 6-1, 6-3 over Riley McQuaid of Texas A&M. Turati is set to play Katya Townsend of Texas A&M Saturday at 9:30 a.m. Labraña is also playing at 9:30 a.m., facing Jayci Goldsmith of Texas A&M. Poluta will play teammate Markovic at 9:30 a.m. as well.